Aim or objective The objective of this systematic review was to evaluate the evidence regarding rest and active treatment/rehabilitation following sport-related concussion (SRC). Data sources MEDLINE (OVID), CINAHL (EbscoHost), PsycInfo (OVID), Cochrane Central Register of Controlled Trials (OVID), SPORTDiscus (EbscoHost), EMBASE (OVID) and Proquest DissertationsandTheses Global (Proquest) were searched systematically. Eligibility criteria for selecting studies Studies were included if they met the following criteria: (1) original research; (2) reported SRC as the diagnosis; and (3) evaluated the effect of rest or active treatment/rehabilitation. Review articles were excluded. Results Twenty-eight studies met the inclusion criteria (9 regarding the effects of rest and 19 evaluating active treatment). The methodological quality of the literature was limited; only five randomised controlled trials (RCTs) met the eligibility criteria. Those RCTs included rest, cervical and vestibular rehabilitation, subsymptom threshold aerobic exercise and multifaceted collaborative care. Summary/conclusions A brief period (24–48 hours) of cognitive and physical rest is appropriate for most patients. Following this, patients should be encouraged to gradually increase activity. The exact amount and duration of rest are not yet well defined and require further investigation. The data support interventions including cervical and vestibular rehabilitation and multifaceted collaborative care. Closely monitored subsymptom threshold, submaximal exercise may be of benefit. An initial period of cognitive and physical rest following concussion is recommended—followed by a progression of gradually increasing activity. The literature evaluating the effects of treatment following concussion is limited. The exact amount and duration of rest is not yet well defined. After a brief period (24–48 hours) of complete rest, patients can be encouraged to become gradually and progressively more active while staying below their cognitive and physical symptom exacerbation thresholds. Research supports interventions including cervical and vestibular rehabilitation (for individuals with persisting dizziness, cervical spine painand headaches). Closely monitored active rehabilitation programmes involving subsymptom threshold and submaximal exercise are safe and may facilitate recovery. Multifaceted collaborative treatments (including cognitive–behavioural therapy, school accommodations and pharmacotherapy) may also be of benefit. The symptoms and problems following concussion can vary considerably, and athletes can also experience associated injury to the cervical spine or peripheral vestibular system. Therefore, a variety of treatments may be required that address ongoing symptoms and impairments following injury.7 8 The purpose of this systematic review was to evaluate the evidence related to two questions: (1) What is the evidence that rest is beneficial following concussion, and is there an optimal duration of rest? (2) What is the evidence that active treatment and rehabilitation is effective for athletes who have experienced SRC? The initial search terms used in this systematic review, the inclusion criteria, exclusion criteria and database selection were generated and reviewed by the author group. The draft MEDLINE search strategy was then sent to an expert librarian (KAH) to ensure its completeness and accuracy. This was done according to the PRESS Guideline Statement using the CADTH Peer Review Checklist.9 The librarian revised and expanded the MEDLINE search, and then translated it for the other databases (see online supplementary tables S1 and S2). An a priori data extraction table was generated and approved by all authors. The following electronic databases were searched: MEDLINE (OVID), CINAHL (EbscoHost), PsycInfo (OVID), Cochrane Central Register of Controlled Trials (OVID), SPORTDiscus (EbscoHost), EMBASE (OVID) and Proquest Dissertations and Theses Global (Proquest). The search was run by the expert librarian and exported for review for the author group (up to and including articles published until 17 October 2016) (see online supplementary tables S1 and S2). Duplicates were removed. References of included papers and systematic reviews were searched for additional references and authors were asked to share any additional references that met the inclusion criteria. The total yield of articles was divided into half and the title and abstract of each article was independently reviewed for inclusion by two authors for each question (four authors in total). To be considered for inclusion in this review, articles had to (1) be original research (including RCTs, quasi-experimental designs, case series, case cross-overs and case studies, cohort and case control), (2) have the focus of the study be SRC as a source of injury and (3) evaluate the effect of rest or treatment. Review articles and articles published in abstract form only were excluded. In the case of disagreement or uncertainty between the two reviewers, a third reviewer was engaged to resolve the discrepancy and where required, full-text manuscripts were retrieved to determine eligibility for inclusion. Extracted data were synthesised qualitatively. We present a qualitative synthesis of the available data regarding the effectiveness and duration of rest following SRC, and a qualitative synthesis of the available data regarding the effectiveness of treatment and rehabilitation for athletes with SRC. Meta-analyses were not performed because the intervention and outcome data were heterogeneous. A total of 8224 citations were identified via the electronic database search and 2518 duplicates were removed. Four other records were identified for a total of 5710 citations. Of the four additional record identified by authors, three were not captured in the initial search as they did not mention sports or related keywords in the abstract or indexing and one did not include terms relevant to treatment or rest. A third reviewer was engaged to assess inclusion following screening of title and abstract for 35 records in which there was disagreement. Forty-one records were reviewed in full text and 29 records met the inclusion criteria (see figure 1 for PRISMA flow diagram). One study was subsequently removed from the review due to its high risk of bias (DB score=2) resulting in a total of 28 studies (see online supplementary table S3). PRISMA flow diagram as follows: Records after duplicates removed 5710; records screened 5710 and Records excluded 5669. A total of 3218 participants (ages 5–53) were included in this systematic review. The studies (five RCTs, nine cohort studies, two quasi-experimental studies, 12 case series) had varying scores on the DB criteria with the RCTs scoring highest—DB range: 18–25, cohort studies—DB: 7–23, quasi-experimental—DB: 15–21 and case series—DB: 6–16. Nine studies examined rest following concussion (see online supplementary table S3). Six studies included both children and adults and three studies included only children. There was one eligible RCT that evaluated the effects of strict rest following SRC in adolescents and found that both groups had a 20% decrease in total energy expenditure following injury.12 The individuals who were randomised to recommendation of strict rest reported higher total symptom over 10 days and had slower symptom resolution.12 Two non-randomised treatment studies recruiting from the same specialty clinic reported benefit from a period of 1 week of prescribed cognitive and physical rest.13 14 Greater activity level was associated with shorter symptom duration in one observational study15 and longer symptom duration in another.16 Two cohort studies found that self-report or parent-report of prescription of rest did not predict a longer recovery.17 18 Two retrospective studies did not find a significant association between recommended cognitive rest and time to symptom resolution.19 20 In summary, there is conflicting evidence on the efficacy of rest following concussion on recovery of premorbid function and symptom resolution. In summary, there is moderate evidence that targeted cervical and vestibular physiotherapy is more effective than typical rest followed by graded exertion to facilitate medical clearance to return to sport. There is limited evidence that collaborative care (including CBT, psychopharmacological consultation and care management) reduces symptoms and improves health-related quality of life in youth. There is conflicting evidence that subsymptom threshold aerobic exercise decreases time to recovery; however, the majority of literature suggests a positive effect. There is no evidence to minimal evidence that medical treatments are of benefit to facilitate recovery following concussion. Most consensus and agreement statements for managing SRC4 40 41 recommend that athletes rest until they become symptom-free. Accordingly, prescribed rest is one of the most widely used interventions in this population.42–45 At least three rationales for rest have been articulated. First, rest probably mitigates postconcussion symptoms, easing discomfort during the acute recovery period. Second, rest might promote recovery by minimising energy demands during haemodynamic and neurometabolic restoration following concussion.46–48 Third, athletes are at an increased risk for sustaining a recurrent concussion within the first 7–10 days after the initial concussion.38 A repeat concussion during this period of recovery might have a magnified effect.49–51 Note that this last rationale for rest is for restricting sport participation and other preinjury activities with an elevated concussion risk rather than for restricting all usual activities (ie, complete rest). There is currently insufficient evidence that prescribing complete rest facilitates recovery following SRC. Observational studies report mixed findings regarding whether physical or mental activity during the days to weeks after SRC are associated with faster or slower recovery times.15 16 19 20 37 Student athletes reported fewer symptoms and performed better on cognitive testing following a week of prescribed rest.13 14 However, the high risk of bias in these uncontrolled and non-randomised studies leaves doubt as to whether the positive outcomes were attributable to prescribed rest versus pre-existing differences, natural recovery, expectations/placebo effects or other therapeutic aspects of the clinical encounter. In summary, the best available evidence from clinical studies does not support the efficacy of prescribing complete rest for more than a few days after SRC. Both observational and experimental laboratory studies have demonstrated that bouts of intense physical or mental activity can exacerbate symptoms in concussed athletes.54–58 These exacerbations appear to be transient54 58 59 and further research is needed to understand the underlying pathophysiology and potential impact on long-term outcomes. In the interim, athletes can be encouraged to gradually resume their non-sport activities as tolerated, avoiding heavy exertion and activities that have an elevated concussion risk until they are medically cleared. Prescribing rest for more than a few days should be weighed against the possible harms of prolonged activity restriction, especially in elite sports.60–62 However, shortening the rest period should not necessarily mean rapid return to sport. Timing of return to sport remains a challenge especially given the evidence for a period of vulnerability to reinjury in some athletes following concussion and should be guided by a multimodal clinical assessment. Multifaceted physiotherapy treatment regimes that include adaptation, balance, musculoskeletal, aerobic, anaerobic and sport-specific exercises might be useful.25 26 However, poor methods (including poor description of the endpoint of return to full activity) limit the conclusions that can be drawn. There is a large body of evidence demonstrating positive treatment effects with vestibular rehabilitation for individuals with vestibular disorders.65–67 Vestibular rehabilitation is safe and effective for peripheral vestibular disorders including unilateral peripheral vestibular hypofunction and benign paroxysmal positional vertigo.65–68 Additionally, studies evaluating the effects of vestibular rehabilitation have demonstrated positive symptomatic and functional improvements in patients who have suffered mild traumatic brain injuries (mTBI) of all types, including blast injuries.69–71 Thus, vestibular rehabilitation may be appropriate for individuals with persistent vestibular findings following SRC. A combination of specific exercises and manual therapy that focus on function is effective for improving pain and function in individuals with cervical spine pain and cervicogenic headaches.72 Thus, inclusion of exercise and manual therapy in the case of ongoing cervical spine pain and cervicogenic headaches following concussion may be of benefit. For individuals with mTBI, there is some evidence to support the use of an educational pamphlet73 74 and CBT.75–78 A recent RCT that employed a multifaceted collaborative treatment protocol including motivational interviewing, school accommodations, CBT and psychopharmacological therapy (where indicated) identified a positive treatment effect on postconcussive symptoms and health-related quality of life.24 Further research to determine the efficacy of rehabilitative strategies evaluating other areas that may be affected by SRC such as cognition, mood, psychological disorders, sleep disturbance and others, in isolation as well as in combination, is required. Studies involving children and adolescent athletes experiencing symptoms for at least 4 weeks following concussion showed similar improvements after completion of a progressive rehabilitation programme.31 32 All young athletes returned to a normal lifestyle and full sport participation. While more robust RCTs are needed, these findings suggest that closely monitored active rehabilitation programmes involving controlled subsymptom threshold, submaximal exercise for adults and adolescents with persistent symptoms after concussion may be of benefit. The results of the two studies evaluating the effects of a symptom-free waiting period suggest that outcomes, such as risk of reinjury, may be more closely associated with an initial period of vulnerability to reinjury than with apparent symptom resolution. Therefore, these findings highlight the importance of injury recognition and prudent return to play decision making by clinicians during the first 10 days after SRC. 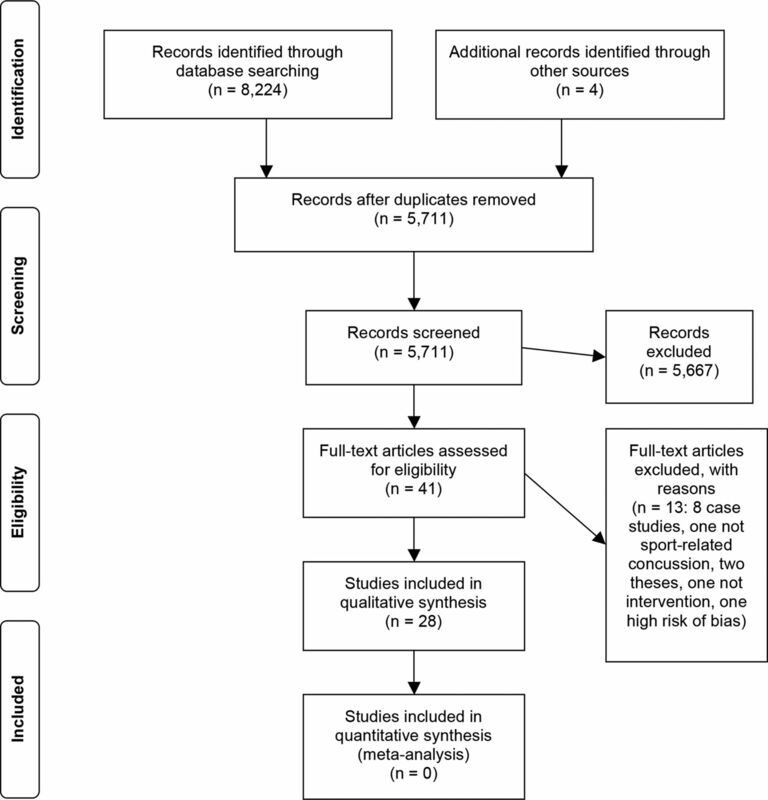 Two RCTs in our review included interventions that involved more than one type of treatment and demonstrated positive effects.24 63 Because concussion is an injury with heterogeneous symptom and functional presentations of patients, multifaceted rehabilitation protocols may be of benefit to facilitate recovery. Further research in this area is needed. Most of the studies included in this review were of low methodological quality and biased by systematic errors. Our review may be subject to a publication bias. This review may be subject to a language bias as we only included articles published in the English language. We only included studies that evaluated rest or treatment for SRC. There may be other treatments of potential benefit that have been evaluated in this population but were not identified by our inclusion criteria. The current literature contains few high-quality studies and many of the current studies included in this review have a high risk of bias. Future studies should evaluate the optimal timing, mode, duration, intensity and frequency of treatment during the postacute time period following concussion, ideally through RCTs, where feasible. To facilitate research and improve the clinical care of PTH, use of the International Classification of Headache Disorders (ICHD) 3 beta standardised criteria is preferable due to its precise classification methods. Further research evaluating rest and active treatments should be performed using high-quality designs that account for potential confounding factors and effect modifiers. After a brief period (24–48 hours) of complete rest, patients can be encouraged to become gradually and progressively more active while staying below their cognitive and physical symptom exacerbation thresholds. Athletes should avoid heavy exertion and activities with an elevated risk of head injury while they are recovering. The exact amount and duration of rest is not yet well defined. A variety of treatments may be required for ongoing symptoms and impairments following concussion. Interventions including cervical and vestibular rehabilitation (for individuals with persisting dizziness, cervical spine pain and headaches) and closely monitored active rehabilitation programmes involving controlled subsymptom threshold, submaximal exercise could be considered. Specific treatment recommendations can be directed based on clinical examination findings and symptoms.
. Clinical practice guidelines for mild traumatic brain injury and persistent symptoms. Can Fam Physician 2012;58:257e128–6740.
. The relationship between adherence behaviors and recovery time in adolescents after a sports-related concussion: an observational study. Int J Sports Phys Ther 2015;10:225–33.
. Cervico-vestibular physiotherapy in the treatment of individuals with persistent symptoms following sport-related concussion: a randomized controlled trial. Brain Injury 2014;28(5-6):796.
. Physical therapy intervention strategies for patients with prolonged mild traumatic brain injury symptoms: a case series. Int J Sports Phys Ther 2015;10:676–89.
. Do family physicians, emergency department physicians, and pediatricians give consistent sport-related concussion management advice? Can Fam Physician 2014;60:548–52.
. The neurometabolic cascade of concussion. J Athl Train 2001;36:228–35.
. Cervicovestibular physiotherapy in the treatment of individuals with persistent symptoms following sport related concussion: a randomised controlled trial. British Journal of Sports Medicine 2014;48:1294–8.
. The peters/price (see to play) vision concussion protocol: diagnosis and treatment? Optometry & Visual Performance 2015;3:126–38.
. The epley (canalith repositioning) manoeuvre for benign paroxysmal positional Vertigo. Cochrane Database Syst Rev 2004;2:CD003162.
. Vestibular rehabilitation for unilateral peripheral vestibular dysfunction. Cochrane Database Syst Rev 2007;17:CD005397.
. A unique collaboration of female medical providers within the united states armed forces: rehabilitation of a marine with post-concussive vestibulopathy. Work 2005;24:381–6.
. Aerobic exercise for adolescents with prolonged symptoms after mild traumatic brain injury: an exploratory randomized clinical trial. J Head Trauma Rehabil 2016. Competing interests KS has received speaking honoraria for presentations at scientific meetings. She is a physiotherapy consultant at Evidence Sport and Spinal Therapy in Calgary, Alberta, Canada and for athletic teams. KG is the Founding Director of the Matthew Gfeller Sport-Related TBI Research Center at the University of North Carolina, USA. He is a member of the National Collegiate Athletic Association's Concussion Committee and the US Soccer Federation (unpaid consultant for both). KG at times receives honoraria and reimbursement of expenses to speak at professional meetings. TS is a member of the Speakers Bureau, Avanir Pharmaceuticals. MMC receives research funding from the National Collegiate Athletic Association (NCAA). NS reports a research salary grant from the Vancouver Coastal Health Research Institute, grants and consultant fees from WorkSafeBC, consultant fees from the National Hockey League, receiving salary from the Vancouver Coastal Health Authority and Home Base, a Red Sox Foundation and Massachusetts General Hospital programme, outside the submitted work. GI has been reimbursed by the government, professional scientific bodies and commercial organisations for discussing or presenting research relating to MTBI and sport-related concussion at meetings, scientific conferences and symposiums. He has a clinical practice in forensic neuropsychology involving individuals who have sustained mild TBIs (including athletes). He receives support from the Harvard Integrated Program to Protect and Improve the Health of National Football League Players Association Members. He acknowledges unrestricted philanthropic support from the Mooney-Reed Charitable Foundation and ImPACT Applications, Inc. MM is a consultant Sport and Exercise Medicine physician at Olympic Park Sports Medicine Centre and team physician for the Hawthorn football club (Australian Football League, AFL). He receives research funding from the Australian Football League (AFL) and non-financial support from CogState Pty Ltd. He has attended meetings organised by the IOC, National Football League (USA), National Rugby League (Australia) and FIFA (Switzerland); however has not received any payment, research funding, or other monies from these groups other than for travel costs. He is an honorary member of concussion working/advisory groups for AFL, Australian Rugby Union and World Rugby.